B2B buyers today report spending more time than ever researching their problems, solutions, and purchases online. 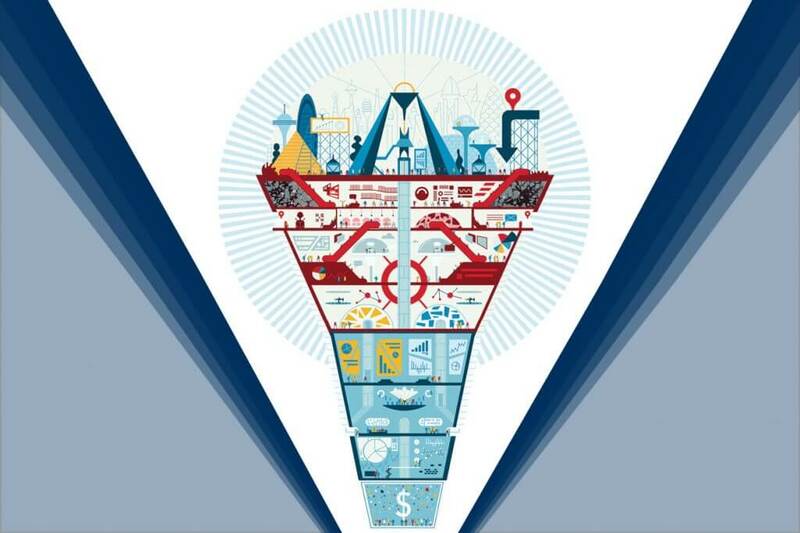 For most prospects, this online research is a quest for a vendor who can prove their merit; a whopping 89% of B2B buyers say their business went to companies who provided “content that made it easier to show ROI.” To move forward with a purchase, decision makers need valuable and relevant content at every stage of their buyer journey. Marketing departments play an increasingly important role in catering relevant content to serve buyer needs (see Figure 1). Custom content curation, nurture sequences, and appropriately timed outreach have become the essential ingredients for revenue-focused marketers. The increasing impact Marketing has on buying decisions should make organizations reconsider their definition of a “lead” and their perception of Marketing’s “job”. The traditional marketing focus on creating demand by attracting attention, identifying leads and sending them to Sales for follow-up is ill suited to modern buyer demands and often results in prospect rejection of the unsolicited Sales intrusion. Reality today is that buyers are in control and savvy brands cater to their needs while seeking to educate and empower them to make the best decision. Consequently, a close collaboration and data sharing is needed between Marketing and Sales teams (jointly referred to as the Revenue Team moving forward) to plan how best to manage the buyer and influence their journey. What information does Marketing and Sales need at each stage of the buyer journey to accurately predict buyer needs and proactively meet them? What engagement signals will be used to identify buyer journey stage and dictate next steps? What type of tactic and messaging will maximize chances of helping the buyer progress to the next stage? And, ultimately, how will we measure the success of our engagement tactics at every stage in the funnel? It is worth noting that we deliberately avoid differentiating Marketing and Sales tactics as it isn’t necessarily a question of which team, but rather, what is the next best action to take. Once the action is identified, a specific stakeholder of the Revenue Team can be mapped to the action. A codified lead management framework defines the stages of the funnel, qualification criteria for each stage, rules that guide how a lead moves between stages, and most importantly the tactics that will be used to elicit positive forward momentum of the maximum number of buyers possible. To start, let’s define lead management, look at why it’s so effective, and discuss how an organization can build a Lead Management Framework to improve Marketing and Sales success. Lead Management is a set of systems and processes designed to move a prospective buyer into a closed sale, executed through a coordinated combination of Marketing campaigns and Sales touchpoints. Data availability and automation are what enables lead management to scale, making marketing operations and sales operations teams major players in its ultimate effectiveness. Effective lead management requires close collaboration between Sales and Marketing (Revenue Team). This may include integrating technologies, aligning terminology, and sharing data on each prospective buyer. Often, companies focus on specific issues or “pain points” when refining their Marketing and Sales processes. For example, they may try a new nurture sequence or do a prospecting outreach campaign. Smaller projects are helpful in driving short term results needed to deliver on quarterly or yearly objectives; however, they cannot address a fundamental external shift in buyer behavior. Buyers today expect companies to understand their needs, enable them, but let them lead the dance. A codified lead management system seeks to enable organizations to understand and effectively respond to the buyer at every stage of the journey. What makes lead management transform sales and marketing is not the functionality, design, or implementation of the system itself. It’s the quality of thinking, perception-shifting, listening, and marshalling that precedes the system. Do the former well, and you’ll have more technology. Do the latter well, and you’ll have more results. Beyond installing new functionality, lead management seeks to install new mindsets, expectations, culture, and behaviours. Here are the key components companies should consider as they start defining and building lead management. Pre-Planning: Plan for planning? Yes. We begin by defining the scope of our problem, intentions, and the coalition. Before thinking in terms of project, we think in terms of people. Planning: Identify and empower a team of co-creators. To aim for a possible future – a better way of working – begin by honestly understanding and capturing the current reality. Where do we excel? Where do opportunities drop off? Where is friction getting in the way of success for marketing and for sales? Lead Qualification: Now we begin to design the concept of ‘demand’. How does sales define a sales-ready lead? How does marketing? How do both teams perceive the optimal moment, mode, or best route of a lead hand-off? Lead Routing: We have consensus around what makes an ideal lead, and at what point that lead is “warm” enough to send over to sales. So now, it’s time to consider how individuals or automated systems follow-up and respond at each stage. Lead Nurturing: Nurturing comprises the best practices, automation, campaigns, and structure that turns qualified leads from “interested into ready-to-buy. Proactive Content: While it’s important to design the funnel, it’s just as important to enrich it with strategic messaging, content, and communication channels to surface unmet needs and draw more prospects in. Metrics: In designing every element of lead management – lead qualification, routing, nurture, content – build-in definition and process for measuring results. In developing processes for the above-listed stages, ensure the resulting Lead Management Framework is codified (clearly documented and future-proof); collaborative (involving Sales, Marketing, and related teams); and measurable. Like most projects of this scale, a Lead Management Framework will evolve over time based on the needs of your audience. Planning ahead for these changes, keeping your systems flexible, and regularly reviewing the effectiveness of your framework will allow you to maneuver these shifts. Ultimately, the success of this framework will be measured by how quickly and effectively it pushes qualified prospects through the revenue funnel (marketing and sales funnel). The methods of moving a lead to a sale can change over time. A proper framework will provide data at each touchpoint to clarify where leads might be leaking out of the funnel, giving you the tools to improve it over time. Is your company ready for a codified Lead Management Framework? All companies managing a considered purchase lifecycle can benefit from implementing effective lead management. Depending on their organizational hierarchy and existing Marketing and Sales processes, most will have slightly different starting points. Some organizations already have the raw ingredients to manage leads effectively, such as a clean database, integrated sales and marketing platforms, and a strong understanding of their funnel. For these organizations, developing a Lead Management Framework may simply be a matter of documenting, measuring, and fine-tuning their current systems and processes. Sales and Marketing Automation platforms like Salesforce.com and Eloqua/Marketo, a clean standardized database, and a well-structured Marketing Operations department are useful to have available before beginning the process of codifying a framework, but these elements are not required and can be developed during the process. Developing a system for proper lead management requires the collaboration of multiple departments. Marketing and Sales leadership must sponsor the project, while key department stakeholders need to be involved as contributors. Through many engagements of this type, we have developed a step-by-step approach that accelerates the process and enables success. We are happy to share what we’ve learned in hopes it will enable more companies to successfully transform how they manage the customer experience and drive more revenue. 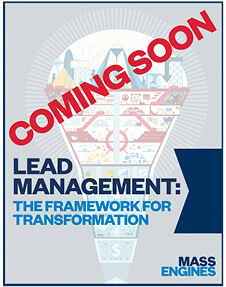 Download our guide to developing an effective Lead Management Framework. If you have any specific questions about lead management, please do not hesitate to contact the MASS Engines team! Are you planning, deploying and testing your lead management framework effectively? These 5 red flags could sabotage your demand generation funnel. Fully embraced, martech has the capability to transform your passive digital footprint into an engaging, interactive and proactive marketing presence.